3.0 out of 5 based on 133 bloggers and 8 commenters. 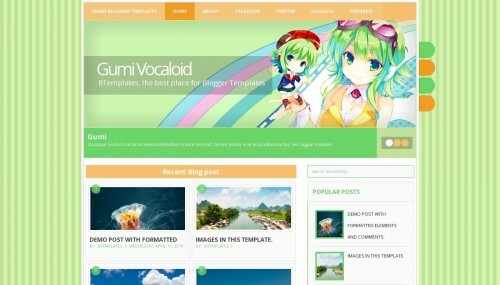 Gumi Vocaloid is a free blogger template with 2 columns, responsive design, seo friendly, right sidebar, gallery-styled, fresh look, an exclusive design for Blogger, slider, social bookmarking icons, posts thumbnails, breadcrumbs, a background pattern, related posts support, well designed threaded comments, cute design and girly looking. Excellent template for blogs about anime, art, to write a diary, fantasy or kids. Wo wo I am very grateful you! This blogger template is very useful and colorful for image and photo gallery blog website. How can i remove this image? This is the clean design. I like your template.